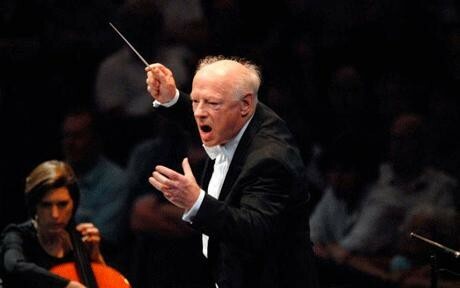 For his 85th birthday Bernard Haitink is conducting several New York concerts. In the 2013-14 season, celebrating the 60th anniversary of his conducting career, Bernard Haitink appeared with Boston Symphony Orchestra at Carnegie Hall. On this all-Ravel program we heard Alborada del gracioso, Sheherazade-Three Poems for Voice and Orchestra interpreted by Mezzo Soprano Susan Graham. After intermission, the orchestra performed the complete ballet Daphnis and Chloe. From the very first bar of the composition Alborada del gracioso, Haitink drew us into the aesthetic world of Maurice Ravel. Some of the outlines of his music were juxtaposed one with another. The harmony, melody, and orchestration which create the expression of a composition were all beautifully articulated. As parts of a unit they were also joined together. This is a remarkable feat by a great orchestra under a superb conductor. The feeling that every single instrument was devoted to their part and note, depicting and reflecting Ravel's conception, did not leave us for one moment. A solo bassoon was exquisite in the first number. The other instruments accompanied its lead. While they play as one, each of the rich impressionist layers of the music's palette were distinctive. The Orchestra easily met Ravels "requirements" of the score, emphasizing colors in orchestration and building of dynamic and atmosphere. The interpretation of Susan Graham in Sheherazade was present and flawless. She seemed comfortable with the music. Graham had space for delivering and living the vocal part. Music for the ballet Daphnis and Chloe was a unique scenic experience particularly where the orchestra was joined by the Tangelwood Choir. In that organic connection, the story/ plot growth was subtle and effortless. Maestro Haitink's vision was clear. Color of the orchestra had a major part in building the atmosphere. The brass section fit in perfectly with its excellent technical and musical interpretation. To celebrate his 85th birthday, Haitink will conduct upcoming performances in New York with the London Symphony, New York Philharmonic, and Chamber Orchestra of Europe. The Carnegie concert with the Boston Symphony was the highlight of his commitment to New York this season.